ST. LOUIS – St. Louis Blues Executive Vice President and General Manager Doug Armstrong announced Wednesday the club has signed forward Jamie Langenbrunner to a one-year contract. The Blues added two-time Stanley Cup champion Jamie Langenbrunner to its roster on Wednesday (Getty Images). Langenbrunner, 35, has played 16 NHL seasons, appearing in 1,035 games, amassing 638 points (237 goals, 401 assists) along with 805 penalty minutes. Last season, the 6’1”, 205-pound forward played in 70 games combined with the New Jersey Devils and Dallas Stars, recording 32 points (nine goals, 23 assists). 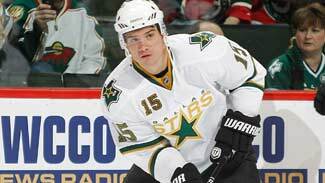 A two-time Stanley Cup Champion (Dallas 1999, New Jersey 2003), Langenbrunner has registered 86 points (33 goals, 53 assists) in 137 NHL playoff games. The Cloquet, Minnesota native served as the captain of the New Jersey Devils for four seasons (2007-11) and also served as captain for Team USA at the 2010 Olympic Games in Vancouver, leading the United States to a Silver Medal with one goal and three assists in six games. Langenbrunner was originally drafted by Dallas in the second round, 35th overall, of the 1993 NHL Entry Draft.